1. Painful Affect. Anger can block off painful emotions so that they are literally pushed out of your awareness. It can also discharge high levels of arousal experienced during periods of anxiety, hurt, guilt, and so on. 2. Painful Sensation. Stress is often experienced as a physical sensation. The most common form is muscle tension, but stressful arousal may also stem from physical pain or sympathetic nervous system activity. 3. Frustrated Drive. Anger can discharge stress that develops when you are frustrated in the search for something you need or want. It functions to vent high arousal levels that inevitably grow as drive activities are blocked. 4. Threat. Any perceived threat, either to your physical or psychological well-being, creates immediate arousal. The arousal mobilizes you and generates a very strong push for some stress-reduction activity. Each of the four types of stress sets off a psychological alarm mechanism that tells you something is not right. As the arousal builds, so too does your need to cope with it, to stop the pain. As you'll soon discover, anger is just one of many coping strategies available to you to discharge stressful arousal. To understand how anger stops stress, it will be helpful to return to the four types of stressful arousal. Anxiety and fear. Consider the mother who, seeing her child run into the street, shakes him and shouts about his carelessness. Anger blocks and discharges her surge of fear so that the enormous terror of losing a child is hardly experienced before the rush of angry words. In the fight that opened this chapter, Leonard is afraid of failing at work and worries that there is something wrong with his heart. The arousal generated by these concerns is discharged for a while by his outburst. Loss and depression. The stress is quieter, more aching here. But sadness creates a tension that is every bit as painful as fear and a need to escape the pain every bit as great. Consider the man whose girlfriend has announced her desire to date other people. The loss of intimacy and of sharing consumes him. Finally he upbraids his secretary for excessive typos, and there is a brief tension release until he resumes his sad review of lovely moments in the relationship. Hurt. The pain of hurt can be so acute that anger is employed as a blocking mechanism almost immediately. A woman is criticized by her husband for being careless with money. She feels humiliated and dismissed. But within a few seconds her arousal is so high and so painful that she explodes in order to block any further awareness of it. You may remember that Sarah had been hurt by her husband's distance and sexual withdrawal. Some of that pain was discharged in her battles with her son. Guilt and shame. Anger erases guilt, It is not you who has done wrong, but the other person. A woman comes home at six o'clock to find her son already in bed, lights out, surrounded by all his stuffed animals. When she asks what he's doing, he tells her that he's lonely. A wave of guilt surges up. As the arousal reaches intolerable levels, she reminds herself that his father never visits, and that's the real source of the problem. Now she is righteous and angry, discharging the guilt in a string of silent condemnations. In the opening fight, James's guilt over inattentiveness to his schoolwork was nicely buried under anger at this mother. Feelings of failure, badness, and unworthiness. Consider the young man who shows some of his poetry to an English teacher. The teacher shows him how the lines don't communicate. For the next 15 minutes the young man wanders the halls, clutching his meaningless garble, feeling a deep worthlessness. The pain accelerates until he seizes on the teacher's accent and mannerisms to condemn him as an "affected twit." Many people have at their core a sense of wrongness or badness that can be activated with the smallest criticism or remark. Anger is a popular strategy to block awareness of these feelings and discharge any consciously felt pain that they might trigger. Rushing. Leonard comes home after rushing to meet production quotas all day. He discharges stress by going on the attack. Physical pain. You have undoubtedly noticed that when you hurt, you become tense. And with little effort, you can find something to get angry at. Imagine the scene where a man is dozing on the beach. His sons are kicking and chasing a beach-ball. One of them trips and falls on him. The man sits bolt upright and cuffs his boy because he has learned to relieve pain with anger. Overstimulation. Too much excitement, too intense a conversation, the success of a great presentation at the board meeting, or a lucky day in the casino can all take their toll. The arousal from the good times may reach stressful levels. When you come home from a day of drama and intensity, anger may be your way of cooling down, of discharging the energy. Muscle tension. In the process of coping with the day, most people gather tension in zones of vulnerability. The forehead, jaw, shoulders, and abdomen are the most common of these zones. Anger can sometimes relieve muscle tension by discharging energy until, in the aftermath, you finally relax. Tiredness and overwork. Fatigue creates stress. Lactic acid builds up in your muscles until your discomfort forces you into some arousal-reduction strategy. Arousal from blocked needs or desires. This is the human condition, the struggle to have what there isn't enough of. Waiting and wanting. Consider the woman whose vacation is again and again delayed because co-workers fall unexpectedly ill and she is needed to fill in during their absence. Finally she is aroused to such a pitch that she attacks her boss as "uncaring and incompetent." She feels good. There is a moment of discharge. Then she is given her two weeks notice. In the opening fight, James's drive for recreation was frustrated when his mother demanded that he stop watching television. Anger was his chosen strategy to cope. Things are not as they should be. Here the frustration is to one's sense of order, oughtness, perfection. Your picture of a world in which people act in good and correct ways is often violated. A checker puts your groceries in a single, flimsy bag. Your silent condemnation of his "wrongness" and "stupidness" creates painful arousal. Your daughter arrives home with a man friend dressed in purple leather. There is something wrong with the picture. As your tension rises, you wonder where she found this cross between a hippie and a motorcycle punk. The sense of being forced. Not only aren't you getting your way, but you are being made to do something that's opposed to your needs or values. A man's lover insists on discussing "the problem of commitment" in their relationship. He knows from experience that she will feel hurt and withdraw if the issue is not explored. As the discussion continues, his tension rises until he blurts out something quite uncomplimentary about her recent haircut. Feeling attacked. Here arousal is immediate. Anger is used to push away the threat so you can return to a relaxed state. Your boss announces that you are among a group of people who will be laid off. Your reaction is shock and a sudden surge in stress level. "Wait a minute, this isn't fair." You start to raise your voice. The anger helps you block awareness of the fear and tightness in your stomach. Feeling engulfed. The experience is one of being controlled, of not having the right to set limits or say no. A teenager who felt overwhelmed by his father's rules and strictures could not bring himself to insist on greater freedom. He dealt with these threats to his autonomy by secretly burning important papers belonging to his father. A woman whose husband insisted that she forego all male friendships experienced this threat as tension in her diaphragm. "I felt I had to go along with it, but sometimes I'd want to scream. I knew if I screamed, I would feel better, so I imagined screaming the most horrible things at him." Feeling abandoned. For a child, this is a threat to survival. Many adults experience abandonment as threatening in the very same way-as if their very existence were in danger, as if abandonment were death. Anger helps block awareness of the fear of loss and aloneness while mobilizing you to end the threat: to leave them before they leave you, to shake some sense into them, to make them hear your pain. The preceding section contained information about BPD and the function of anger. Write three case study examples regarding how you might use the content of this section in your practice. 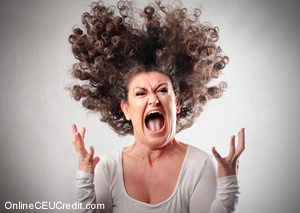 What are four kinds of stress that anger serves to dissipate? Record the letter of the correct answer the CEU Answer Booklet.